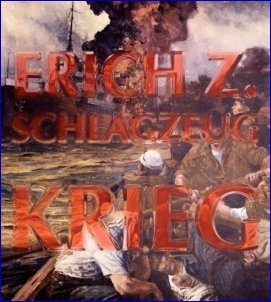 Erich Z. Schlagzeug - "Krieg"
Ok, so, who is Erich Z. Schlagzeug? Erich is a German born drummer who left his native country after fantastic events detailed in the bio included in this CD. The story raises the eyebrows and furrows the brow with doubt, and while it's tempting to relate it here I'll refrain. What's important is that Erich ended up in Shrewsbury, UK and in the summer of 2006 met Stephen Palmer, who upon discovering Erich was a drummer invited him to participate on Mooch's Dr Silbury's Liquid Braintem Band album, and Erich has been the drummer on every Mooch album since. Krieg (German for 'war') is Erich's first solo album and consists of damn good instrumental space rock over three tracks, with help from Steve on guitars and bass and Dave Dilliway on audio generator and gliss guitar (Erich plays trombone and keyboards too). The title track opens the set with nearly 13 minutes of chilled out space exploration. Erich keeps a steady beat going and we've got some light Dub grooves, while the keyboards and synths provide mucho cosmic ambience and effects. Steve's guitar gives the music a little psychedelic Eastern flavor at the beginning but then morphs into pure space. This will feed your hed nicely. Wo? is next and is pure liquid psychedelicized space jamming. Layers of tripping soloing guitars lead the way along with ebbing and flowing soundscapes, all propelled by Erich's assertive drumming. Erich is really rocking out on the drums, but the overall vibe, though energetic, and even a little intense, remains nicely chilled out. Erich even steps out with a trombone solo near the end, which sounds really cool within this deep space context. Killer trip guitar from Steve on this one too. At nearly 17 minutes, Ziet is the first indication of the albums war theme. It opens with air raid horns and a sample from what may have been a WWII radio broadcast. But it quickly settles into the most rhythmic groove of the set. It's even a bit jazzy. And along with that we've got more of Steve's trip guitar, plus the same ambience, soundscapes and lysergic effects that have characterized the rest of the album. But it also ends up being the most volcanic music of the set, building to an explosive crescendo that recalls The Spacious Mind at their most rocking intensity. I got a kick out of the way the trombone fills the gap when the eruption subsides. An excellent set of exploratory cosmic instrumental space rock!